Its an effort to introduce you one of the Dark Horses in my list or a future multibagger. I have placed a link to the edited screenshot from the BSE site which tells you everything about the history of its performance. I strongly believe that the history will reiterate. If you convinced, please include it in your PF. Electrotherm India Ltd have 3 divisions, Metallurgical Equipment Division, Steel Division and Auto Division (Indus Elec-Trans, manufacturing electric two wheelers). Electrotherm has its network at as many as 27 places in India and also in Africa, Bangladesh, China, Iran, Malaysia, Pakistan, South Africa, Turkey, Russia and other CIS countries. The company has signed a memorandum of understanding (MoU) with Canadian firm, Electrovaya. This MoU is for the purpose of forming a joint venture (JV) for manufacturing lithium ion polymer batteries. This joint venture will set up an advanced lithium super polymer battery plant with a capacity of up to 10 mw hours a month. The batteries will be sold in the zero-emission electric vehicle market in India and abroad. 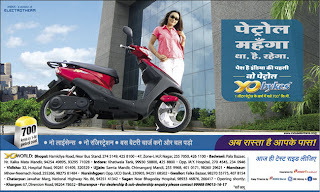 Electrotherm India launched the high-speed version of e-bikes, 'YO-Speed' . 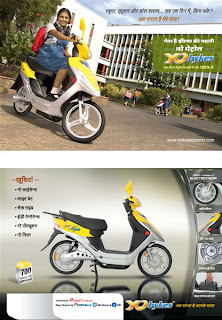 The "no petrol scooter" with 33AH battery and a 750 watts motor has the power to seat two. The company has signed a memorandum of understanding (MoU) with Ningbo Olisen Bipolar Batteries, China for technology transfer to manufacture special kind of high energy electric two-wheeler batteries. Indus Elec-trans, a division of Electrotherm (ET), is formed to manufacture electric vehicles and hybrid electric vehicles. 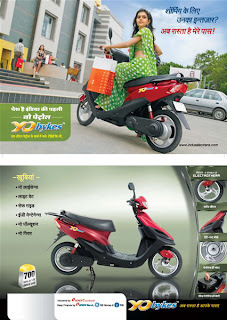 Currently INDUS has commenced manufacture of hi-tech electric two wheelers, YObykes at the plant at Kutch in Gujarat. Development of Electric three wheelers, four wheelers and hybrid electric low floor buses are on anvil for future. Will you include this in your PF ? or after a ride ? I am not responsible for your investment decisions. Please do your own research before any investment. Impressive Shabu, Buy range is good advise. I am very bullish on emerging sector. will definitely include in my PF if it reaches 60-65 range. Electrotherm's performance in the past has been excellent. But in the last two quarters, the profit margin has declined and so the EPS. Also Hero Group is coming up with these kind of vehicles. So how do you see the future for this stock now? Hyderabad, Feb. 14 Hero Electric, part of the diversified Hero group, is set to launch a range of electric bikes during the year, including their first “high speed” bike range within two months. The Managing Director of Hero Electric, Mr Naveen Munjal, said the company has firmed up plans to roll out at least seven more models during the calendar year, which includes two in the high speed category. Electric bikes with speeds of 25 km/hour and above are classified under high speed category and the Hero Electric high speed range, to be rolled out soon, will have capability to manage 45 km plus speed, Mr Munjal told Business Line during his visit here. Mr Munjal said the market for electric bikes is yet to fully blossom into full scale and there is immense potential for growth. However, to really harness the potential of such bikes, some Government push, including tax concessions, is required like witnessed in China. The electric bike makers have formed a Society of Manufacturers of Electric Vehicles (SMEV), which has 27 members. “The overall market is estimated at about 1,30,000 bikes and we see this number going up by about 70-80 per cent next year and potentially doubling if the Governments extend some subsidy, like the Delhi Government,” he explained. A lot of work is also now under way to improve the life of battery that goes into these bikes. Typically, a battery lasts a charge of 330-340 cycles and could be used for about 12-16 months. By adopting a range extender, the life of these batteries could be extended, he said. The company now has about nine models in its stable including Maxi, Optima Plus and recently launched Wave. “We expect to add at least seven more models during the year. The dealership network will also be expanded,” he said. Ahmedabad, Jan. 8 Electrotherm (India) Ltd, pioneer of battery-run two-wheelers in the country, will set up a battery manufacturing plant in Gujarat this year with an investment of around Rs 20 crore. This month, Electrotherm is also commencing export of these two-wheelers to Nepal and Sri Lanka. Electrotherm expects to sell 30,000 no-petrol, no-licence, and no-registration vehicles this year. The company’s scooter plant in Kutch currently has an annual capacity of 2.88 lakh vehicles. Today, Electrotherm introduced its new product, YOelectron, in the 250-watt category, with a battery recharging time reduced from eight hours to 210 minutes. Weighing 73 kg, and priced between Rs 28,5000 and Rs 29,500, the vehicle can run at a maximum speed of 25 km/hr up to a distance of 75 km on a single-charge of battery. Another 250-watt category scooter offered by the company is YoSmart. But 50 per cent of sales is due to the 750-watt YoSpeed scooter whose maximum speed is 45 km/hr. The company, listed on the Bombay Stock Exchange (BSE), already has a battery plant in China with a capacity to manufacture 3,000 kilo-watt-hour (kvh) of battery a month, which powers 2,000 electric-run vehicles. All the batteries manufactured by the Chinese plant are consumed by Electrotherm which also procures supplies for its two-wheelers from other sources. Battery alone costs 30 per cent of the total price of these vehicles. With the new proposed plant in Gujarat, the capacity of 7,500 kvh would be enough for another 6,000 scooters a month, Mr Mukesh Bhandari, Chairman and Chief Technical Officer (CTO) of Electrotherm, told Business Line . The Ahmedabad-based company has sold 60,000 battery-run two-wheelers since these were introduced in the country in early 2006. 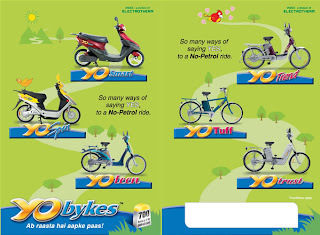 Sold under the brand-name of Yobykes, Electrotherm would also embark on battery-run three-wheelers in the next two years’ time after achieving sale of one lakh two-wheelers, he said. Sales of two-wheelers contributed Rs 70 crore to the total sales of Rs 1,325 crore in 2007-08 by Electrotherm, whose mainstay is in foundry and steel/alloy steel industry. Thank you for the comment and providing good articles for readers. I am personally believe in the strong management of electrotherm, Mr Mukesh Bhandari. I think we can skip the last two quarters for now, as there were not much good players in the list. Another plus points is DEG, Germany has acquired 1,366,666 shares of the company and invested Rs.820 Million.International Finance Corporation invested Rs. 1000 Million in the company as FCCB and ECB. The china story is also encouraging. My view on the competition is, Electrotherm were walking on the track till the time, but now they have to run.. Lets see. Thanks.